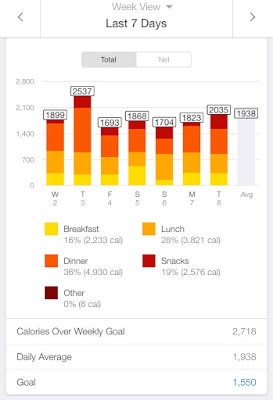 Wow, it's been 30 weeks since I started counting calories? It seems like it was just a month ago! I've now been on maintenance for 15 weeks, and I'm kind of stunned at how well I'm doing. 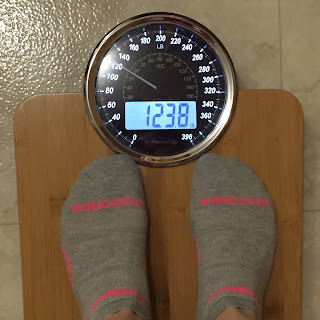 I never expected to struggle as little as I have, let alone get under my goal weight. I'm not saying that it's been easy, but it definitely feels much easier than the last time I hit my goal weight. I got a new scale last week, and I actually really love it! I have been SO attached to my Health O Meter for over a decade, because it was just so reliable; even after trying other scales, I would go back to the Health O Meter each time. Now, I think I've found a winner! That said 123.8, so it's almost 2 pounds heavier than the Health O Meter. I did some experimenting to see which is correct, and I discovered something odd. When I would put a dumbbell on my Health O Meter, it would always read the correct weight of the dumbbell (my "accuracy" test), so I assumed it was accurate. The new scale gave the same exact reading for the dumbbell, meaning it was ALSO accurate. How could that be? After a bunch of experimenting, I discovered that the more weight that is on the Health O Meter, the less accurate it gets... and at my weight, it's off about two pounds. I weighed myself before going to the doctor's office yesterday, and the doctor's scale read the same as this new scale. 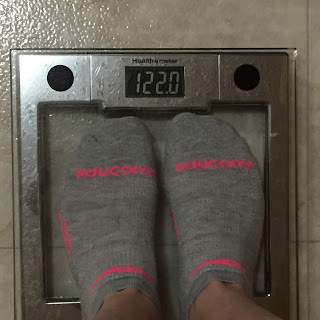 So, while I didn't gain any weight this week, I'm going to consider 123.8 my current (accurate) weight. (Interestingly, it's very likely that my starting weight was actually 255 or 256 and not the 253 my Health O Meter read). Anyway, about the new scale... I originally saw it on Instagram, and the girl using it had a discount code, so I thought I was getting it for a good deal at $50 ($64 after shipping). Turns out, you can get it much cheaper! It's called the Balance2 Digital Body Scale, and here is a link to the cheapest place I've found it online--it's $39 with FREE shipping (that's not an affiliate link, so I don't get anything for sharing. Just thought I'd save you $25 if you're looking for a new scale and like this one.) I think it's such a pretty scale, and I'm so glad that it's accurate and consistent! This week, I ate an average of 1938 calories a day, so I think 1900-ish seems to be the number my body likes to maintain my weight. 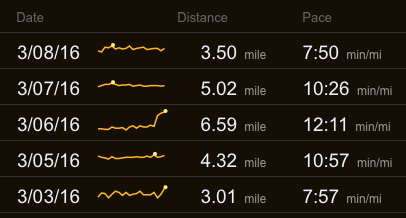 I had a great week with my running--two 3+ mile runs at a sub-8:00 pace, which definitely helped with my confidence in going forward with my race training. My 80/20 ratio (easy running to moderate-hard running) was slightly off, at 78/22, so this week, I'm going to try and add a little more easy running to get the ratio at 80/20. I really need to increase my long runs a bit, too--I'd like to get in a couple of 10+ milers before the race. 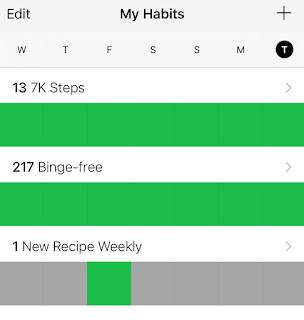 7,000+ steps 6+ days/week: I actually got in all 7,000 steps every day this week! Staying binge-free: Today is Day 218, and I'm getting stronger by the day :) I'm now even able to keep Nutella and even ice cream in the house without so much as a thought of bingeing on it. Trying one new recipe weekly: This week, I tried Crock Pot Sweet & Sour Meatballs. I love the kind of crock pot recipes that you just throw things in and then they are done when you're ready to eat. The only prep for this was to chop a green pepper and combine the sauce ingredients to pour into the pot. I had six meatballs with half a cup of rice, and it was 430 calories. The meatballs (and sauce) were very good! The whole family liked this recipe, and I'd definitely make it again. Overall, awesome week and I hope to have a repeat of it next Wednesday! Katie, I was at CVS today and picked up a runner's world publication that had your name, story, pictures - but they had misidentified you as a 46-year old insurance operator from Wauwatosa Wisconsin! I noticed those incorrect details were the same as another person featured (a guy). It was a strange booklet format of RW (not the glossy magazine) that said to display until June 2016. Anyway you might already be aware but wanted to give you a heads up! Interesting! I didn't know anything about it. It must be the article from the April 2014 issue that I was in. It sounds like they misidentified me as Rik. Thanks for letting me know--I tweeted Bart Yasso and he said he'll look into it, although I'm not sure there is anything he can do about it now, unfortunately! I just have to tell you what an inspiration you have been. 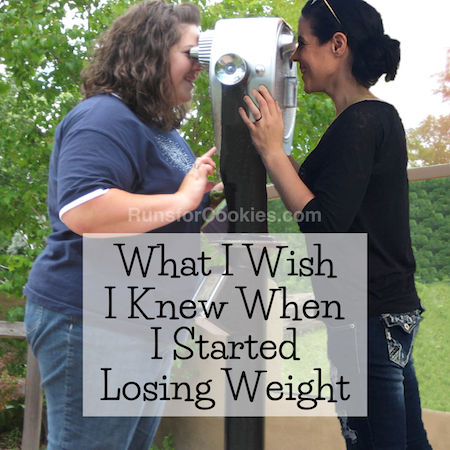 I loved your posts on binge eating. It really hit home for me. I started following some of your ideas- 3 good meals and 1 yummy snack. If I ate more for lunch I'd have a lighter dinner. 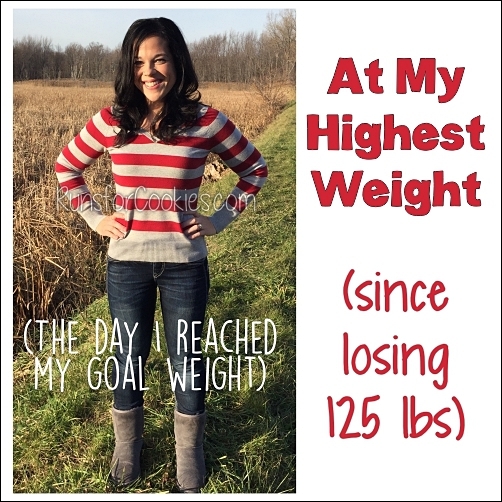 I have been binge free since February 1 and lost 10 pounds. I have 3 more pounds to get back to my goal weight. There were honestly days I never thought I'd get back. I'd be on track for two or three days and then fall back into my old ways. I loved when you posted pictures of some of your meals on Instagram. My new favorite breakfast is a larabar with peanut butter. I love new ideas to try. I just wanted to thank you for all of your inspiration and motivation. I love how real you are. Thanks for the scale recommendation! I'm so glad I found your blog! 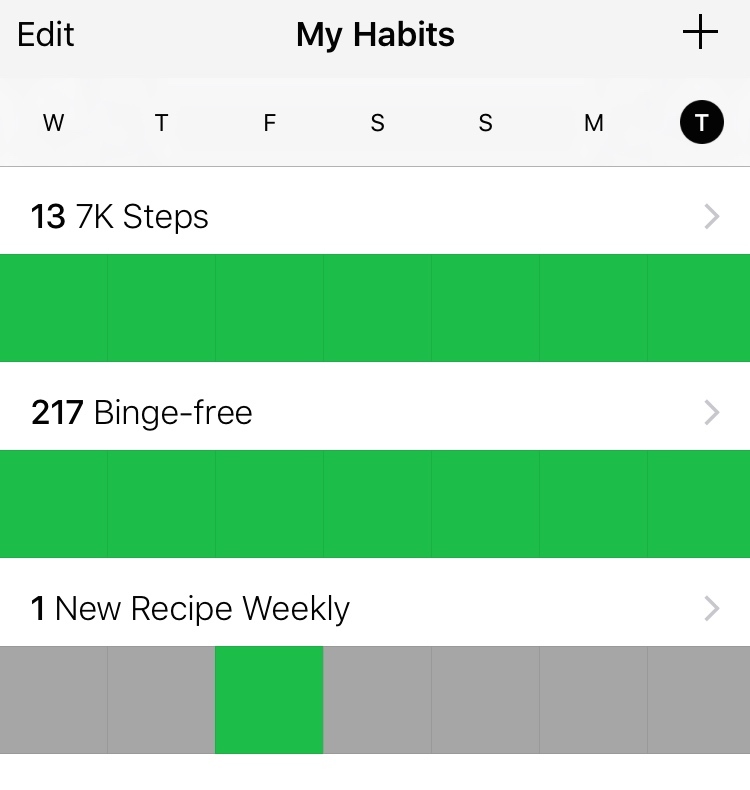 About 2 months ago I switched from weight watchers to calorie counting after reading some of your posts. 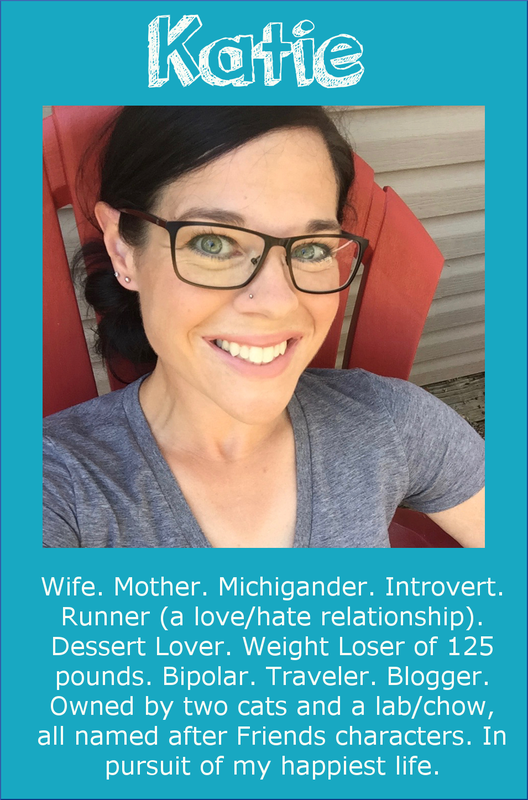 I love my fittness pal and it's so nice to read your posts and find real-life inspiration-- so thank you! Thanks Brenna! I, too, love My Fitness Pal. I'm glad that you are enjoying the change as well! Just curious how come if you loved your old scale so much, and it seemed to be doing the trick, what was the inspiration/desire to not only get a new one, but to get a whole new brand? I've never owned a scale, and kind of prefer it that way, that way I only weigh myself at the gym/dr appts, but have considered getting one every now and then. 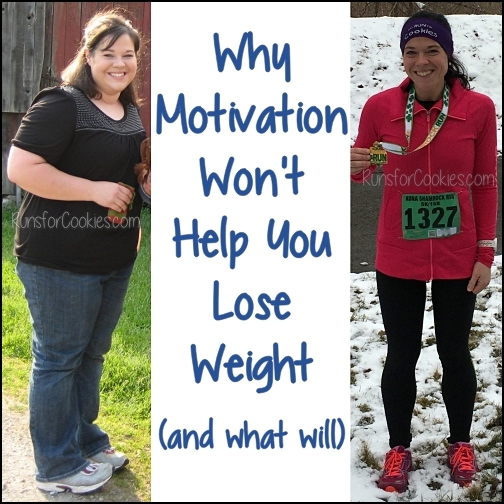 Some people do really well without weighing, which is great! I'm not one of them, unfortunately. When I've tried hiding the scale for a while, I eat too much and gain, knowing that I don't have to see the consequences. makes sense to me! It is REALLY pretty!! 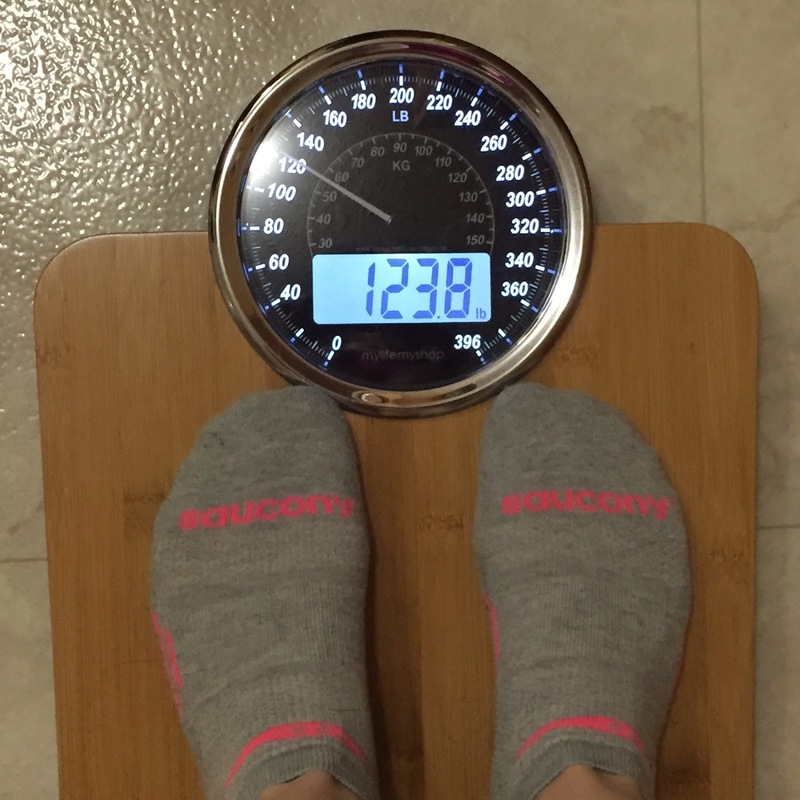 I love the look of that new scale!! I'll have to do a little research on it, I've been looking for a new scale myself. Good job on another great week! Side note, I was reading your comments above and noticed you said Rik is from Wauwatosa?! That's my neck of the woods!! I didn't know that! Thanks for writing your blog. 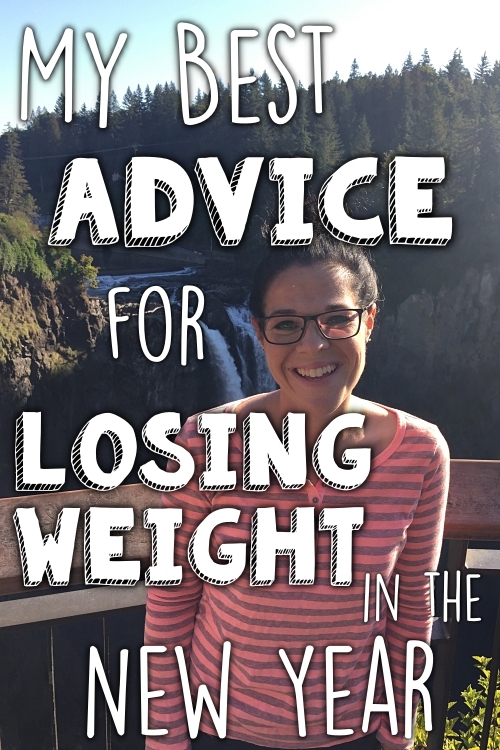 While I'm not looking to lose weight, I'm inspired by the weight loss you have experienced and grateful for the inspiration you are to so many people. I read your blog primarily for running tips, and so my question for you regarding the 80/20 ratio. How did you determine you were at 78/22 this week? How did you figure that percentage? I added your total mileage up (22.44), then I figured your two hard runs were 3.50 and 3.01 (6.51) and then divided that number by 22.44 and got 29% or a 71/29 split. What am I doing wrong as I want to start figuring out that percentage for my runs? Thanks much for your time. Hi Steve! 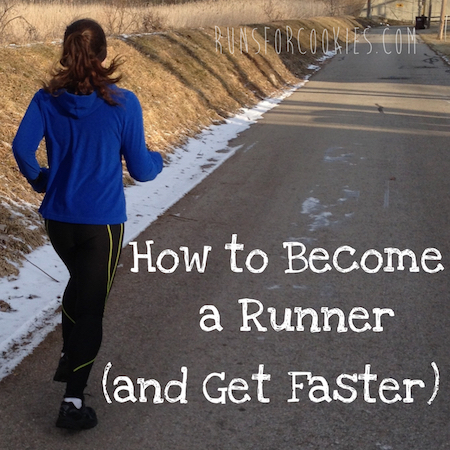 To calculate the percentages, you should use the time spent running rather than the mileage. That is how the book described it. Hope that helps! I've been contemplating that scale for months, but I have a perfectly good one!! Please let us know after a couple of months how you still feel about it. Before I buy one, I want to know that it really is accurate and consistent! Again, love reading your blog! You are doing so awesome and you look tiny! Thanks for the info on your new scale. I 'm going to check it out! Okay, thanks so much for replying!! :) Love your blog!